No-Frills Donation: Make a difference without selling, buying or baking a thing! Your one-time donation to the Seth Boyden PTA will go directly to funding many important programs, projects and events for our children. You can donate through PayPal, or fill out this form and send in a check. SOMA General Store: Make a purchase on the SOMA General Store, put Seth Boyden in the comments, and check out. When you do, a percentage of the sale will go to our PTA. Smile.Amazon.com: Our school can receive 0.5% of any purchase you make on Amazon. 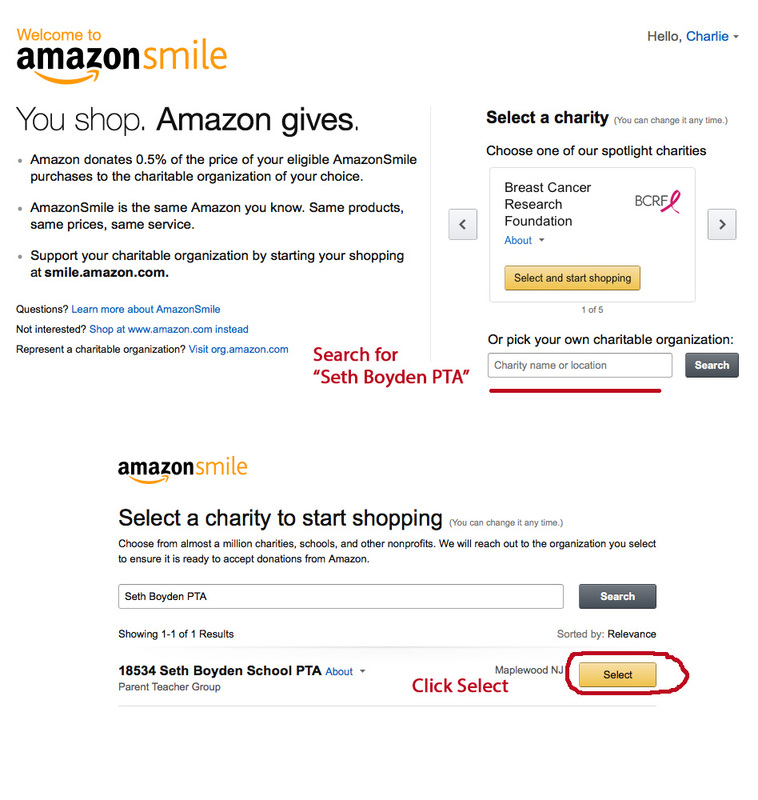 Go to Smile.Amazon.com, sign into your Amazon account, search “Seth Boyden PTA” and then click Select. 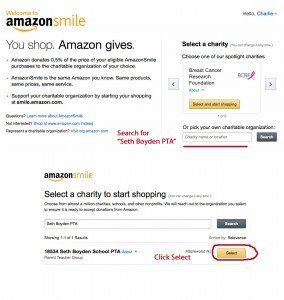 This will associate your account with Seth Boyden, and the PTA will benefit every time you buy something after starting on Smile.Amazon.com. Click the image at right for details. Box Tops for Education: You will receive a flyer every month to fill in and return with your Box Tops. Remember: Only send in unexpired Box Tops. Shop With Scrip: This program allows you to buy gift cards for specific retailers that you already frequent. When you use your card, Seth Boyden gets cash. It’s that simple. Learn more and sign up. Stop & Shop: Do you buy groceries? Have you ever been in a Stop & Shop? If so, we have a super-easy way for you to contribute to the Seth Boyden PTA. Sign up for their A+ Rewards program. ShopRite For My School: You can earn money for Seth Boyden when you buy General Mills, Reynolds or Hefty Box Tops for Education products at ShopRite and use your Price Plus club card. Learn more and sign up on shopriteformyschool.com.